Today our great state of North Carolina and our nation is holding an historic election. Millions of North Carolinians and voters across the nation have already cast their ballots during Early Voting, with North Carolina at the top of the list for Early Voting turnout. New voter registration records were set and an unprecedented Democratic Presidential campaign was launched in our state. 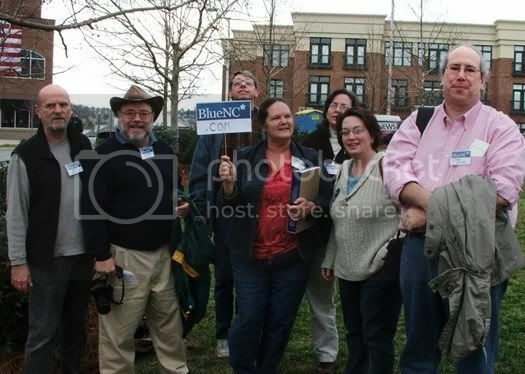 With over 60 Presidential campaign offices, countless satellite sites and thousands upon thousands of volunteers, the Obama campaign ground game is like none other North Carolina has seen. As millions more head to the polls today, many of us will be participating in our final day of volunteering for our Democratic candidates this cycle. This has been no easy task. Some of us started off supporting other candidates during the primaries but got right back on that horse after our candidates lost. There was no time for hesitation. There is too much at stake. Throughout this campaign, we have endured disappointments, outrage, worry, long days with thousands of hours and dollars donated. But what will stay with us are those glorious moments of hope and inspiration--the amazing experiences we have had along the way and the unforgettable people we have met. Mostly though, we have been enriched by the opportunity to fight for our "quiet heroes” and for those here at home and abroad whom have suffered injustices and cruelties. Obama Tears Up Over Grandmother: "She was a Quiet Hero"
[We fight] “to continue the long march of those who came before us, a march for a more just, more equal, more free, more caring and more prosperous America. After Barack Obama becomes the next President of the United States and our NC Democrats take their new positions, we will continue our march for justice. For today, we will spend every moment we can, working to win this election! I cannot believe THE DAY is here! It's been my hononr to share it with so many of you. I'm looking forward to hearing about everyone's election day and watching those results roll in tonight! My husband and I are headed out to volunteer for the day, hoping for a big victory! That photo at the top is a true blast from the past. Seems like decades ago! My God, we've been through a lot this campaign cycle. I have butterflies today...whoa. I hope we pull in a lot of wins in NC today, including at the top of the ticket. I just heard on the news that the power went out at one of the election sites in Charlotte. Just happened to be a primarily Black district.